If you thought all Thai food was super spicy, think again! 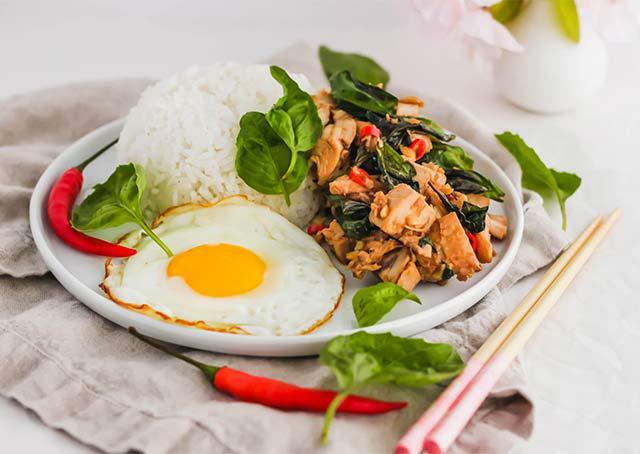 Pad Krapow Gai, Thai Basil Chicken, is savoury, aromatic, and garlicky. 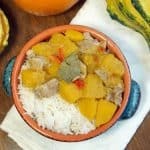 This recipe is so comforting and delicious served over rice with a fried egg. 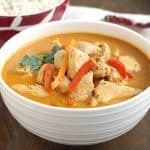 Is there a cuisine that you tend to just go out for? For me, it’s Thai food. Although somewhat memorable, my first experience with Thai food was not the best. I was 17 years old and about to leave for University. My family was invited to a relative’s birthday party, and they were having Thai. All I remember was that EVERYTHING they ordered was so spicy and salty, I couldn’t eat very much (and I would say that I have a pretty high spice tolerance level). My parents and other family members were huffing and puffing with tears in their eyes, struggling to eat the spicy food. I couldn’t count how many times we needed our water glasses refilled. Needless to say, Thai food was never one of those cuisines that ranked high on my list to eat after that experience. Fast forward to married life prior to kids… it’s date night and we’re changing up our regular go-to of Vietnamese food. So we decided to go out for Thai food at this house/restaurant (yes, literally, it was a restaurant inside of a house) in Edmonton. 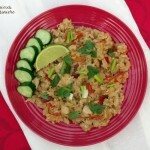 We ordered a few of the usual suspects: Pad Thai, Laab, and this dish, Pad Krapow Gai, which is Thai Basil Chicken. 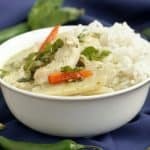 Savoury, aromatic, and garlicky, it changed my perspective on Thai food. Not all Thai food was so spicy that you couldn’t literally taste anything! In fact, it was so flavourful and delicious! I couldn’t help but finish the entire plate. 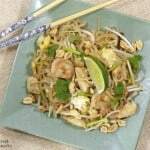 WHAT IS PAD KRAPOW GAI? The dish is a nod to the stir-frying cooking process which was adapted from the Chinese. 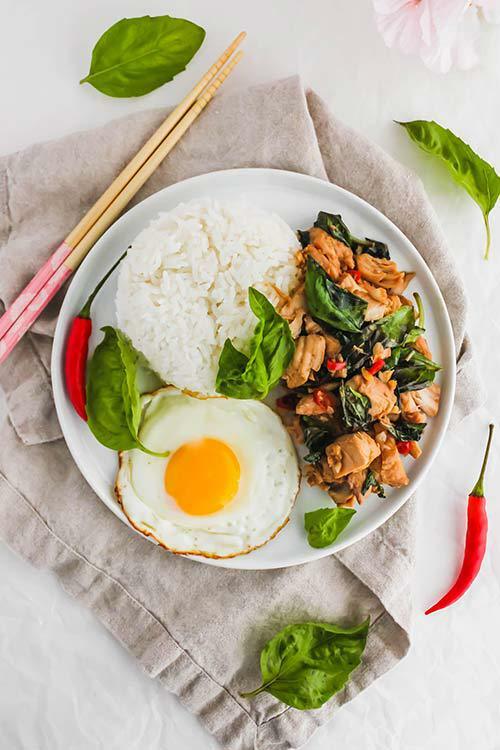 Pad Krapow consists of meat, such as chicken, pork, or beef, or even seafood, stir-fried with basil, chilies and garlic, served over rice and egg. Except, Holy Basil which is native to Southeast Asia, is hard to find up here in Canada and the US. Holy basil has medicinal properties which give it its more spicy, peppery taste. It is also different than the more commonly found Mediterranean sweet basil, which tastes more sweet (for lack of a better word). However, a good substitution if you don’t have access to holy basil is Thai sweet basil, which can be found commonly at Asian supermarkets. Thai basil has purple stems and has a more predominantly spicy licorice-anise flavour, but if you’re in a pinch and can’t find Thai basil, regular sweet basil will work just fine. Thai chilies (also known as bird’s eye chili) are very spicy, red, small slightly curved chilies that pack a punch. They can be found at Asian grocery stores in small packages in the produce section. In terms of spiciness, they are not as hot as a habanero, but they are many more times spicier than jalapeno. The flavour and hotness from a Thai chili is quite distinct, but if you’re not able to get your hands on fresh Thai chilies, your next best bet is to use cayenne powder (which you may already have in your pantry). For this recipe, substitute 1 tsp of cayenne powder if you don’t have fresh Thai chili. And, if you’re wanting to go with a fresh chili, try using a serrano chili, which won’t pack as much heat, but will give some flavour to the dish. 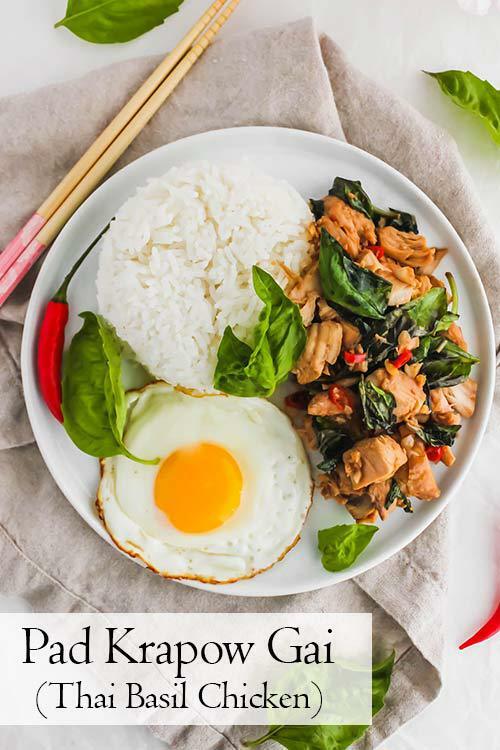 Hot steamed rice topped with chunks of fragrant, savoury and garlicky chicken and a fried egg makes this an amazing Asian comfort food dish. 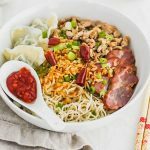 This dish is commonly made with ground chicken, but I chose to go with chicken breast rather than ground chicken, as it’s much easier for me to find chicken breast in the supermarket. If you wanted, you could definitely use ground chicken — just cut back a little on the cooking time as ground chicken is much smaller and will cook up faster. For flavouring the chicken, oyster sauce is a savoury, thick, brown condiment made from cooking down oysters that is commonly found in Asian supermarkets. It gives this dish a deeper, richer umami taste. If you can’t find oyster sauce, you can omit it. 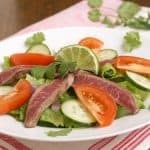 Fish sauce is also another condiment that is made from fermenting fish and gives another dimension of savoury taste, somewhat similar to soy sauce. Again, if fish sauce isn’t available in your area, just substitute with soy sauce. This recipe also calls for both light and dark soy sauce. The most common soy sauce to find in a general supermarket is light soy sauce. Dark soy sauce is usually found in Asian supermarkets. It is less salty in taste and often contains molasses or caramel color. It is primarily used to give dishes a darker colour and a richer taste. If you don’t have dark soy sauce, simply omit it from the recipe. Pad Krapow Gai cooks up really quickly, in less than 5 minutes! As with most cooking, it’s important to have all of your ingredients in place before starting. Once you’re organized, you’re on your way to a delicious and hearty meal that’s faster than ordering takeout from your favourite Thai place! 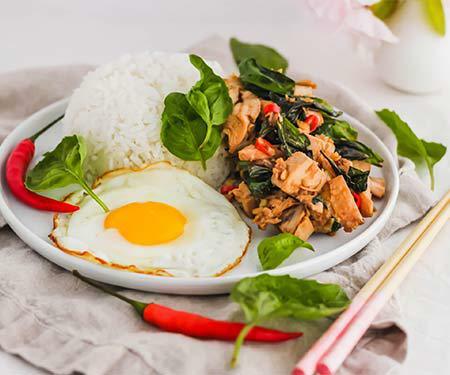 Pad Krapow Gai, Thai Basil Chicken, is savoury, aromatic, and garlicky. 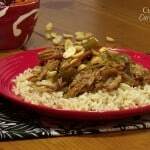 This recipe is so comforting and delicious served over rice with a fried egg. In a large wok or frying pan, add 1 tsp vegetable oil and heat over medium high heat. When the oil is hot, crack an egg into the oil and let it fry up for about 2-3 minutes, or until it's cooked to your liking. Remove the egg and transfer to a clean plate. Repeat with the remaining eggs. Set aside. In a small bowl, whisk together the chicken broth, oyster sauce, light soy sauce, dark soy sauce, fish sauce, and 2 tsp sugar. Set aside. Using the same wok, turn up the heat to high and add in the 2 Tbsp oil. Add in the shallots, garlic, and Thai chilies and quickly stir fry until fragrant, about 1 minute. Next, add in the cubed chicken and continue to stir fry for another 2-3 minutes. Pour in the chicken broth liquid and toss to coast all of the chicken. Be sure to scrape the bottom of the wok to remove any sticky brown bits that are full of flavour. When most of the chicken broth has evaporated, turn off the heat and add in a large handful of Thai basil. Stir to incorporate the basil into the chicken as the residual heat will continue to wilt the basil. Remove from heat. 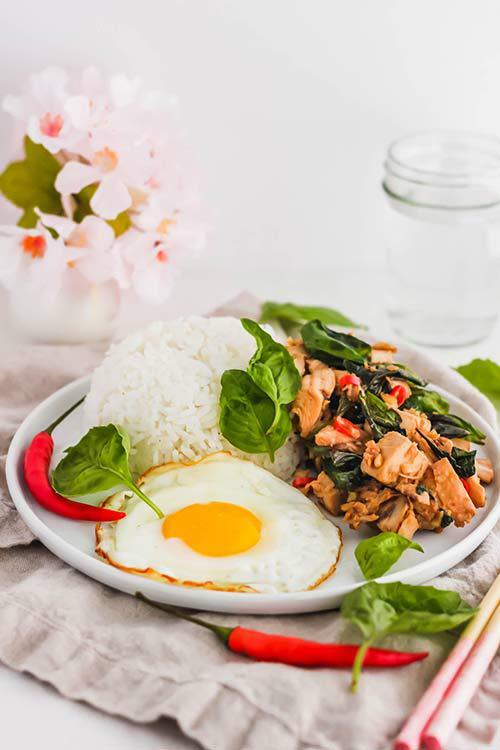 Serve the Thai Basil Chicken with fresh hot steamed rice, and a fried egg. Garnish with additional basil leaves. Best served hot. *Or substitute 1 tsp cayenne powder if you don’t have fresh Thai chilis. This looks so good! My husband and I love Thai food. We even filled our suitcases with Thai curry paste to bring to Paraguay. Yes! very spicy, but so delicious! Saving your recipe for later. I need to find that basil first.